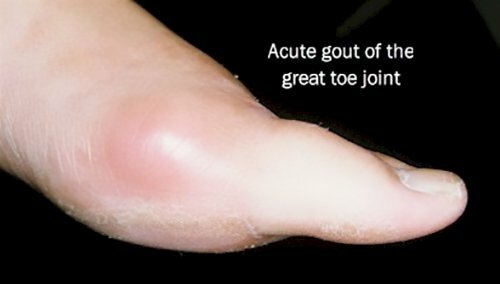 Gout is a form of crystal deposition arthritis, hence the name gouty arthritis. Uric acid, a chemical that is found in the serum component of our blood, and a by-product of protein metabolism, is the key chemical that contributes to gout. In a liquid form, uric acid is an essential component of normal metabolism. The painful symptoms of gout occur when uric acid changes from a liquid to a solid. This transformation from a liquid to a crystal occurs with a drop in body temperature. 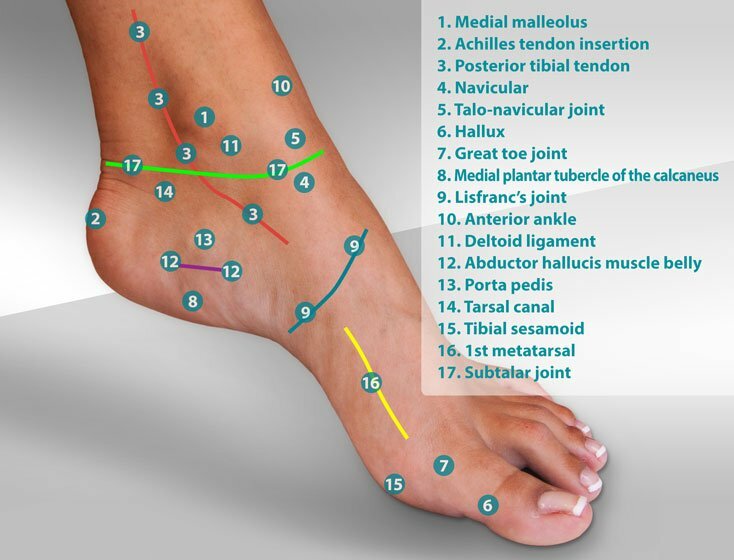 Excessively high levels of uric acid lead to the deposition of monosodium urate crystals into joints and certain subcutaneous spaces in the body that are close to the skin and affected by variations in body temperature. Gout is found more commonly in men than in women. Gout is usually found in men between the ages of 40 and 70 years. Gout, also called podagra, is a form of arthritis that affects 1-2% of the western population. Gout is a crystal deposition disease that can be easily described by this example: as children, we would make our own rock candy. We'd get a pot of water and begin to heat it on the stove. As the water warmed, we'd add sugar. The hotter the water became, the more sugar we could dissolve. When the water was close to a boil and saturated with sugar, we would remove it from the heat and allow the sugar to crystallize on a string as the water cooled. The crystallization of the sugar was due to high concentrations of sugar that could not be supported in solution as the temperature of the water cooled. Acute gouty attacks are due to the same crystallization process. Uric acid is measured in the serum (liquid) component of our blood. Normal levels of uric acid for men are less than 7mg/dl of serum and slightly less for most women. This level tends to rise in women following menopause. The vast majority of gout patients are men with an onset during the 4th to 5th decade of life. If serum uric acid levels surpass 10mg/dl, the likelihood of a gout attack is very probable. Individuals who have had acute gouty attacks should limit their intake of these foods. (4,6) This does not mean that they need to completely eliminate these foods from their diets, but rather they should consume these foods with moderation. Serum uric acid is also significantly influenced by the ability of the kidney to excrete uric acid. Factors that may change normal renal function may result in limited excretion of uric acid. These factors include the use of thiazide (HCTZ -hydrochlorthizide) diuretic therapy, dehydration, and renal failure. Many antihypertensive (blood pressure lowering) medications include HCTZ and include Dyazide, Maxide, Moduretic, indapamide, Microzide, and Zaroxolyn. Low doses of HCTZ do not seem to increase the risk of gouty attack. (7) Additional medications that may contribute to gout include niacin and aspirin. (6) Other factors that may contribute to the onset of gout include trauma, the stress of surgery, emotional stress, fatigue, infection or the use of penicillin. 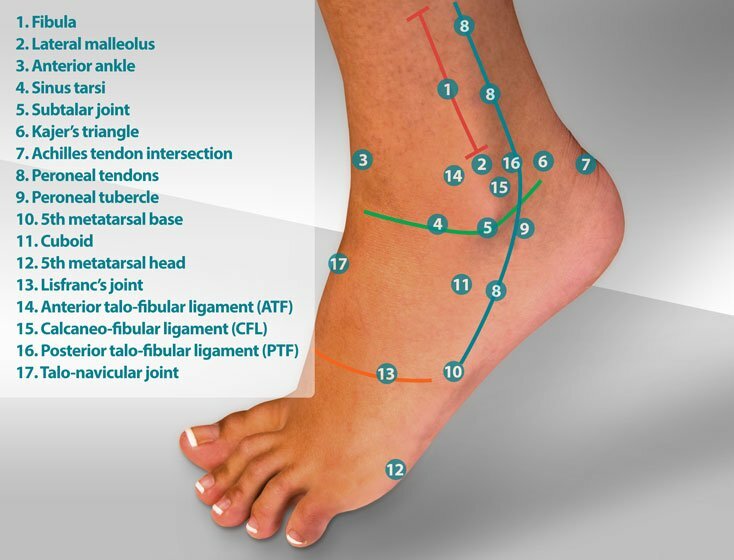 The diagnosis of gout can be confirmed with aspiration of synovial fluid from the affected joint. Distinctive uric acid crystals can be identified with microscopic fluid analysis. The most significant consideration in the treatment of gout is the frequency of attacks. Frequent attacks (more than once a year) will result in progressive erosion of the joint, leading to painful chronic arthritis. Isolated attacks (less than once a year) lead to minimal destruction of the joint. 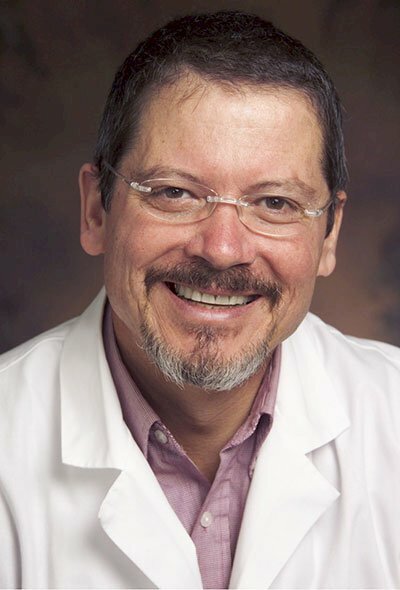 The frequency of gouty attacks determines whether treatment is merely for each individual attack, or whether daily medication should be taken to lower levels of serum uric acid. Treatment of an acute gout attack includes the use of prednisone or non-steroidal anti-inflammatory medications such as Indocin or Clinoril. Control of pain may require a mild narcotic such as codeine. Other treatment may include Colchicine (Colcrys) which yields dramatic results but carries severe side effects which include nausea and severe diarrhea. Colchicine is dosed once every two hours until the desired (or undesired) effects are achieved. Recurrent attacks of gout in patients with hyperuricemia are common and occur greater than once each year in more than 60% of patients with hyperuricemia. (9) Treatment of recurrent attacks includes modifications in diet as previously discussed and the use of Allopurinal (Zylorpim), an inhibitor of uric acid synthesis. Probenecid is also used to increase the output of uric acid by the kidney. Dosing and combination therapy depends upon the level of serum uric acid which is measured periodically during therapy. Individuals prone to gouty attacks should also maintain a high fluid intake to promote the excretion of uric acid and decrease the tendency to form uric acid stones in the kidney and bladder. Uloric (febuxostat) is another medication that may be used as an alternative to Allopurinal. Acute and chronic gout should be managed by your doctor to prevent destruction of the joint. 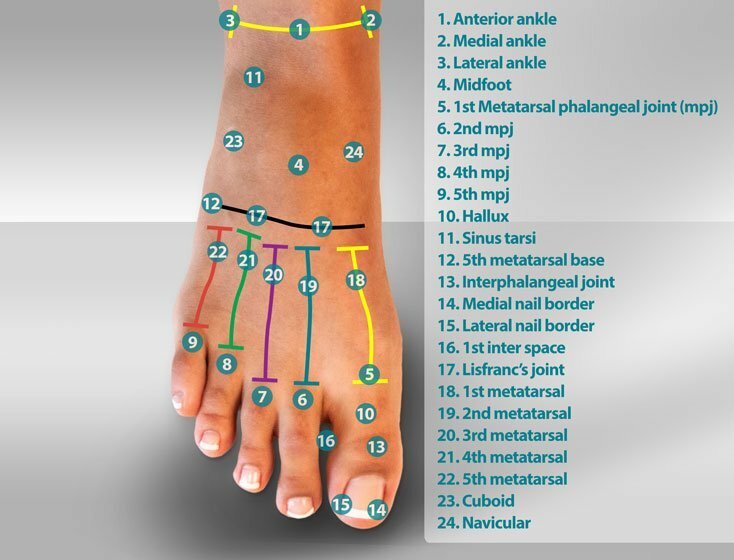 Contact your local podiatrist or orthopedist for additional information on the treatment of gout. Most recent article update: December 7, 2018. Gout by Myfootshop.com is licensed under a Creative Commons Attribution-NonCommercial 3.0 Unported License. 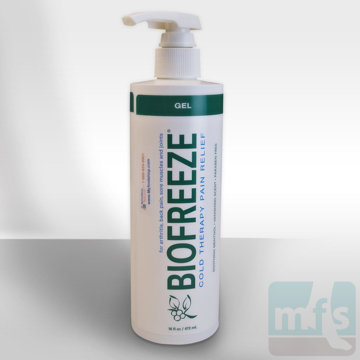 Biofreeze is a grease-less, stainless, topical pain relieving and cooling gel used to treat muscle and joint pain. 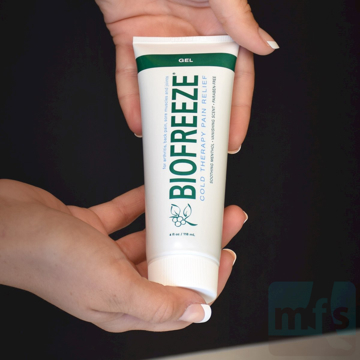 Biofreeze is also a great massage medium for sore joints. Won't stain clothes. Rub it in and feel the relief! By BioFreeze. 4 oz. tube. 1/pkg. Biofreeze is a grease-less, stainless, topical cooling gel used to treat muscle and joint pain including arthritis. Biofreeze is also a great massage medium for sore joints. Won't stain clothes. Rub it in and feel the relief! By BioFreeze. 16 oz. pump bottle. 1/pkg. 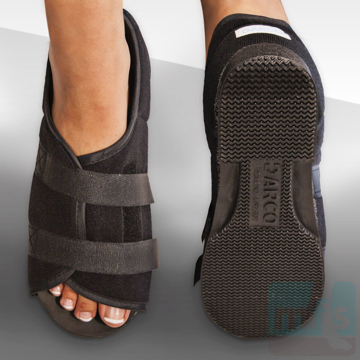 The Post-Op Shoe is an open-toe shoe with a soft upper and semi-flexible sole, designed to protect the foot after injury or surgery. This fracture shoe is used for broken toes, metatarsal stress fractures, and other foot injuries. Universal right/left. Black only. By Myfootshop.com. 1/pkg.